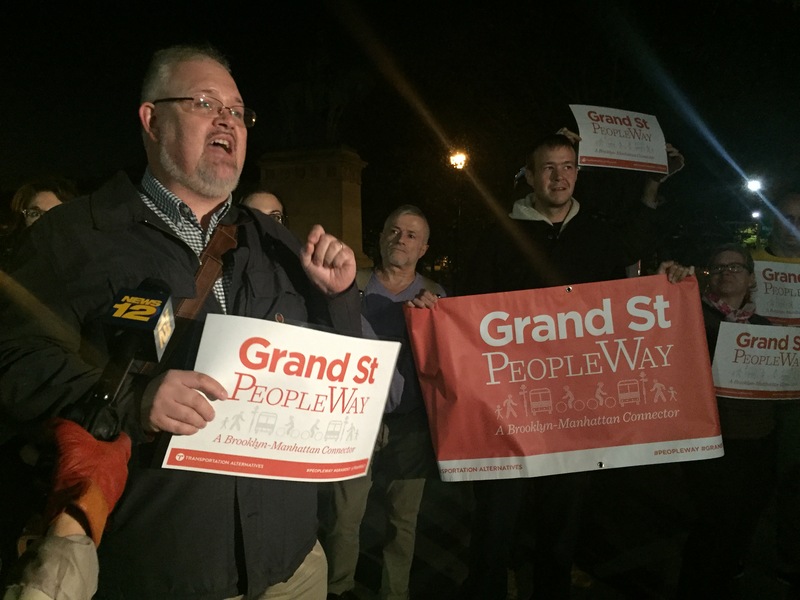 Volunteers from Transportation Alternatives rallied on the Brooklyn side of the Williamsburg Bridge last night to call on the city to prioritize Grand Street for buses, bicycling, and walking when the MTA shuts down the western portion of the L train for 18 months to make Sandy-related repairs. Every day, New Yorkers make hundreds of thousands of trips on the portions of the L that will be affected. While some of these passengers can shift to other subways, there’s no way to accommodate all that travel without also repurposing street space for spatially efficient modes. In Manhattan, TA has called for a car-free 14th Street “PeopleWay” exclusively for buses, bikes, and pedestrians, a concept that has the support of Manhattan Borough President Gale Brewer. On the Brooklyn side, Borough President Eric Adams has called for dedicated bus lanes on the Williamsburg Bridge, but otherwise little attention has been paid to L train riders who’ll need better surface transportation options. The Williamsburg Bridge also serves as the main link in the bike network between North Brooklyn and Manhattan, and is likely to experience increased bike traffic during the shutdown. While Grand Street doesn’t precisely parallel the L train, it connects to the Williamsburg Bridge, making it the most direct route for buses to carry people across the East River. Currently, 13,000 people travel on the corridor each hour, Ohlson said. The PeopleWay proposal for busways and bikeways would nearly triple that number. Since the July hit-and-run driver killing of 35-year-old Matthew von Ohlen, who was riding in a painted bike lane on Grand, advocates have called on DOT to put a protected bike lane on Grand Street. They have the support of Council Member Antonio Reynoso. Brooklyn Community Board 1 has asked DOT to study the concept. When are people going to start talking about closing a north/south street in the East Village? Buses on 14th St are going to need a connection to the bridge. I nominate Essex St/Ave A.
I agree, but please do not use the word “closing.” By making it car-free, we are opening up the street to people. Sorry for the late comment, but it is really “expanding” if you consider the increase of the number of people. The vast majority of L riders between Brooklyn and Manhattan will use other subway lines to make their trips. The need for increased bus capacity across 14th Street is primarily to accommodate crosstown riders within Manhattan who currently use the L. There are already five north-south subway trunk lines with direct connections to the Williamsburg Bridge services. Without the L train, Grand Street will be gridlocked by a surge of car traffic, unless dramatic action is taken to prioritize surface transit, biking, and walking. Will Brooklyn Streets Get the Transit Priority They Need During the L Train Shutdown? During the L shutdown, the MTA plans to run shuttle buses at rush hour connecting Williamsburg to Manhattan. Some sort of transit priority treatment is on the table for Brooklyn streets where buses connect to the bridge, but what DOT has in mind isn't clear.